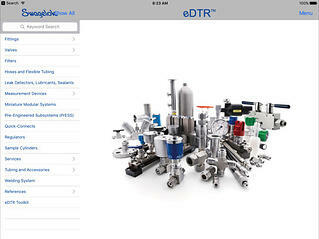 Download the free iPad App Electronic Desktop Reference (eDTR). The Electronic Desktop Technical Reference (eDTR) provides on-the-go access to a comprehensive library of Swagelok product data, including catalogs, installation instructions, technical bulletins, product test reports, videos, and certifications. Free monthly content updates ensure that you always have the latest information on your device.